The Star Wars Battle Escape attraction is now known as Star Wars: Rise of the Resistance. The ride is the main E-Ticket attraction inside Star Wars: Galaxy’s Edge. 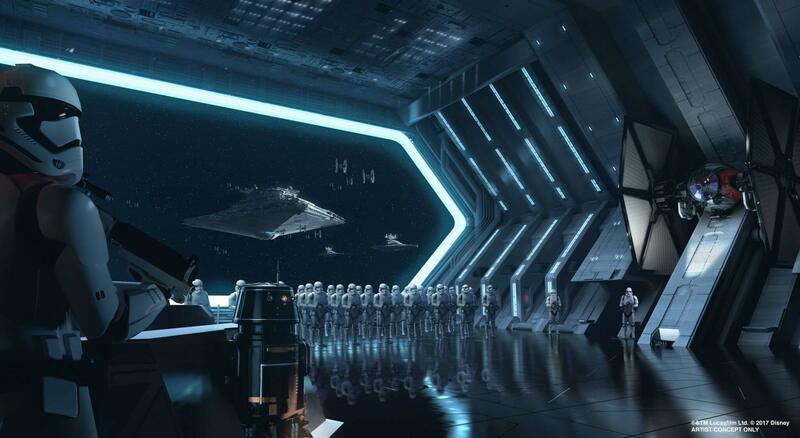 The ride will put guests right into the action in a fight between the First Order and The Resistance. Rise of the Resistance is located inside laser carved caverns on the outskirts of planet Batuu where the resistance have created a secret base of operations. Imagineers have alluded to many different ride styles being a big part of the fun of this attraction and not much is currently known beyond the fact that you switch vehicles. You’ll see characters from the new Star Wars trilogy on the ride. Confirmed are Rey, Finn, Poe Dameron, and Kylo Ren throughout the Star Wars: Rise of the Resistance. You’ll also come face to face with Animatronics of BB-8, Nien Nunb, and Hondo Ohnaka from the Clone Wars. Guests will also come face to face with an army of Stormtroopers where some are animatronic and others are stationary. We’re guessing it will look similar to the first picture as we currently know there’s a room full of them along with a hundred-foot projection screen. At the 2017 D23 Expo we were introduced to additional pieces of Star Wars: Galaxy’s Edge and also the First Order Fleet Transport. This is the ride vehicle for Rise of the Resistance that guests will be in during at least one part of the ride. Where is Rise of the Resistance located? The ride entrance will be located in the far corner of the Black Spire Outpost where the Resistance base is located. If you’re in the main marketplace area of the Black Spire Outpost the ride entrance will be to the left. Millennium Falcon: Smugglers Run is located to the right of the main area of the land. It really comes down to how you enter but the rides are separated by the marketplace in the middle.